The superiority of the “Porter-Blum” MT-2 in every aspect is evident from the moment the operator looks at the instrument. Integrated, single-unit design is combined with logical placement of all controls. Uniform sectioning of the highest quality is possible with the MT-2, with repro ducibility of sections an automatic achievement. Alternate thin and thick sectioning is easily accomplished when desired. A pivoting stereomicroscope mount and built-in cold light source for wide angle illumination of the cutting area are basic features. 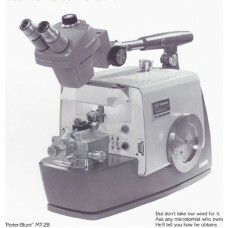 The advance system is mechanical, and follows the well- established, proven principles of previous “Porter-Blum.” The specimen is advanced to a fixed knife. Glass or diamond knives may be used. Specimens, round or flat embeddings, are held securely in adjustable holders situated at the end of a cantilever arm. Advance, and hence thickness of sections, is determined by two controls — an upper pivot control and a panel-mounted thickness dial. Movement of the knife stage assembly is universal, with coarse and fine forward and reverse adjustment, and micrometer lateral adjustment. Orientation scales are provided for additional convenience. Precision trimming of specimens prior to sectioning may be performed right on the MT-2. The drive system is motor and/or manual! and motor speeds which are set by dial are infinitely variable between .09 mm and 3.2 mm per second. If the operator should elect to use the motor drive, he may still override it by turning the handwheel manually without any harm to the instrument! It should be pointed out that the sectioning capabilities of the MT-2 are limited only by the suitability of knives currently available. The stated thin-sectioning limit of 100A is in this respect somewhat arbitrary. The instrument itself is capable of performing well below this thickness. However, sections of such extreme thinness are rarely satisfactory for study. Nevertheless, it is indicative of the overall refinement of the MT-2 that it can operate at such fine tolerances, and it is one of the many reasons the MT-2 is years ahead of any competitive instrument. The Above Applies To The MT-2 “Porter-Blum Ultra-Microtome. The Advance System For The MT-I “Porter-Blum” Is Similar Except That The Pivots Are Fixed In Relationship To Each Other Instead Of Being Variable As In The MT-2.